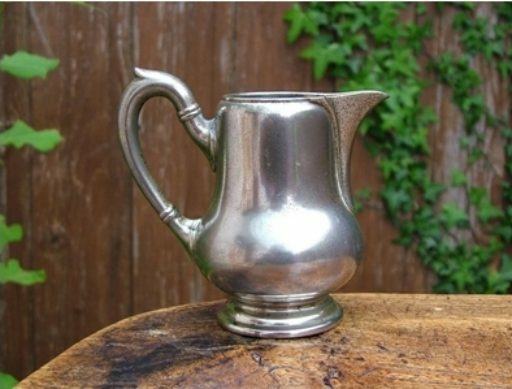 In my previous article published in Silver Magazine (see Bibliography), I made a detailed study of the marks used for high-quality silver-plated hollowware (with triple-layer silver coating of Alpacca alloy, so-called Alpacca Silber I) issued by the Berndorf metalware factory. This paper is devoted to a brief listing of marks issued on more low-quality items, namely, on pieces made of pure Alpacca alloy, as well as of Alpacca base covered by a double layer of silver (so-called Alpacca Silber II). 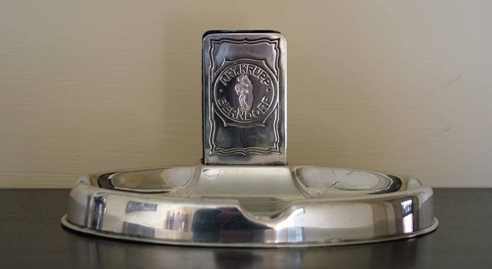 The Alpacca alloy was developed in 1823 by the German chemist Dr. Ernst August Geitner (1783-1852). It was very similar in its appearance to silver, but significantly cheaper. Therefore, this new alloy was first called "Argentan". It consisted of 20% nickel, 55% copper and 25% zinc. The new silver-imitating alloy soon became very popular. 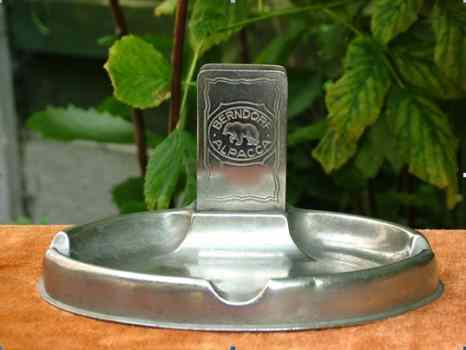 The Gebrueder Henninger (Henninger Bros.) proposed a similar alloy (5-30% nickel, 45-70% copper and 8-45% zinc with trace amounts of lead, tin and iron) which they called "Neusilber". Later both Argentan and Neusilber were used under the trade name of Alpacca (or Alpakka). 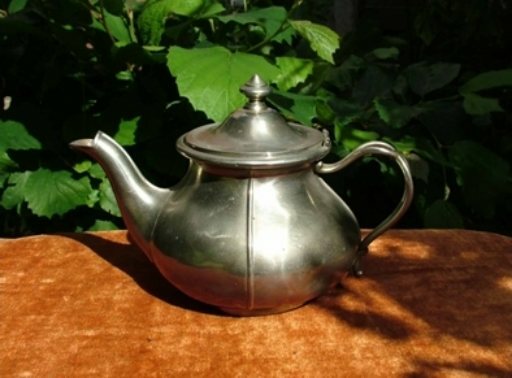 The great advantage of the use of Alpacca alloy as the base metal for silver plating is that the appearance of the objects does not change significantly with the wearing away of the silver layer. For the measurements of marks I used a microscope with 0.05 mm accuracy. All the photographs were made using a Fuji FinePix S7000 camera. 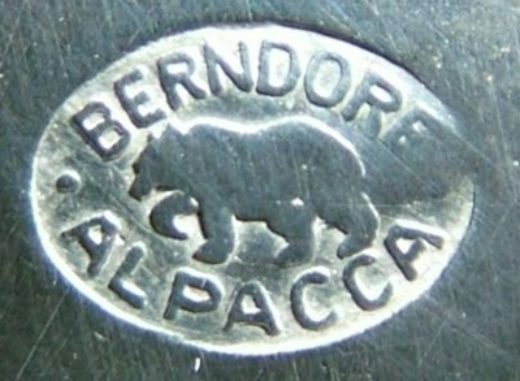 The earliest known Berndorf Alpacca mark (No.1) was introduced around 1880 and used until 1891. I found it on the bottom of a 30 cl teapot bearing the inscription KRIEAU, which corresponds to the "Wiener Krieau", the famous race course in Vienna. The mark No.1 represents an oval of 3.0 x 3.6 mm size bearing the lettering "BMF ALPACCA" (which means Berndorfer Metallwaaren Fabrik or Berndorf Metalware Factory) with the "M" and "F" letters being fused. Inside the oval there is a profile of a walking bear looking down. This mark is quite rare. 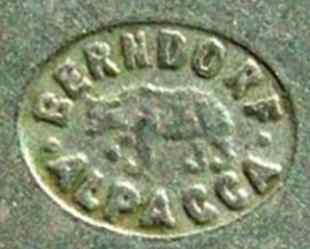 The next Berndorf Alpacca mark (No.2) was applied in 1891-1930. 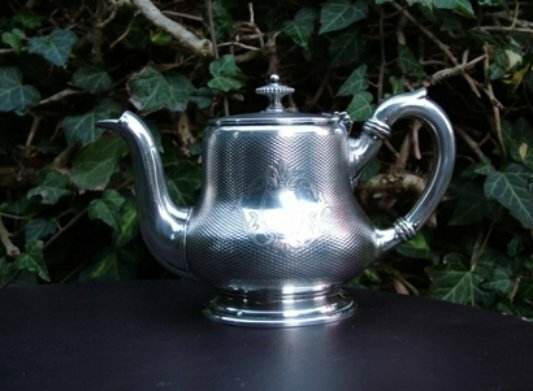 It is rather common, I have four pieces with this mark, including the 40 cl teapot shown below. 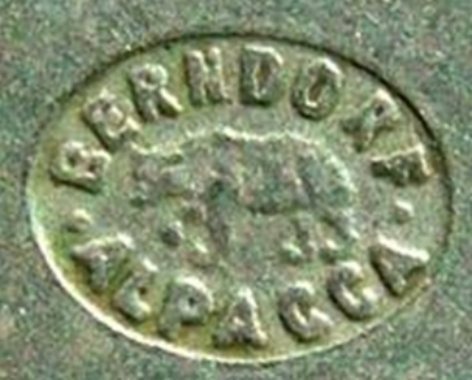 The mark No.2 represents an oval of 3.6 x 4.6 mm size (the mean value of four measurements), bearing the lettering "BERNDORF ALPACCA" and the horizontal dots separating these two words. Inside the oval there is a profile of a walking bear looking down similar to that of No.1. 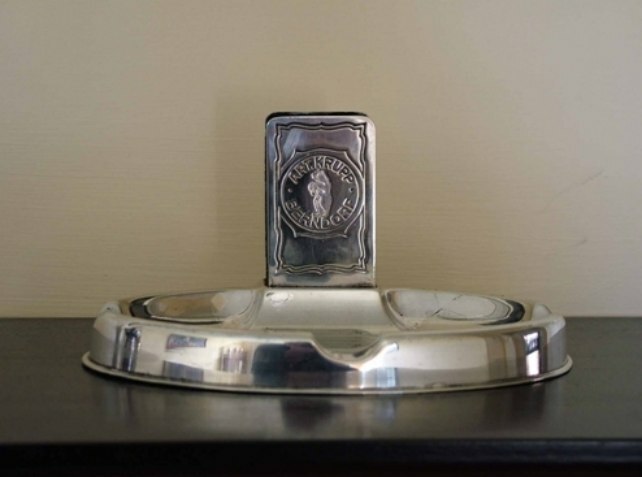 The third Berndorf Alpacca mark (No.3) was found on a 15 cl creamer, which was issued between 1930 and 1938. This mark is similar to No.2 with the exception of the larger size (4.5 x 6.5 mm) and the different profile of the bear: fatter, with both ears visible and looking forward. This mark is also quite rare. Two last Berndorf Alpacca marks in my collection, No.4 and No.5, were issued in 1938-1945, after the death of Arthur Krupp. Therefore, they contain the side wording "KRUPP" and "BERNDORF", which appear to the left and to the right of the oval. I was able to distinguish two types of oval: with a flat bear profile (No.4) and with a relief one (No.5). The sizes of the ovals are also different, 3.5 x 4.5 mm and 2.8 x 3.5 mm for marks No.4 and No.5, respectively. The profiles of bears were also slightly modified in comparison with No.3. 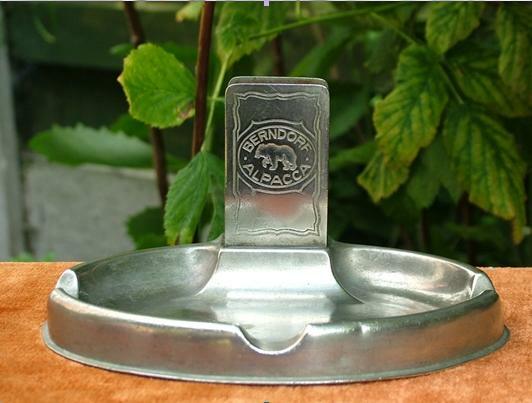 The first Berndorf Alpacca Silber II mark (No.6) was introduced around 1880 and used fifty (!) years until 1930. 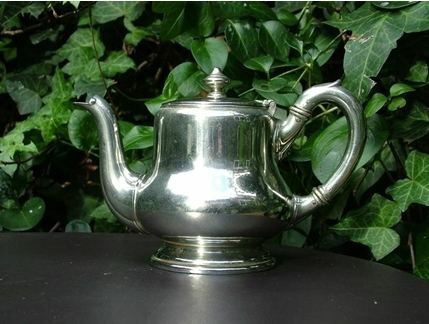 Such a mark was found on the bottom of a silver-plated 30 cl teapot. 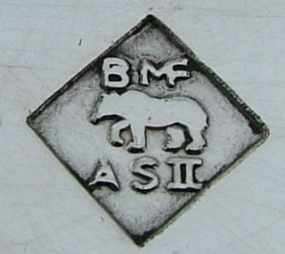 Inside the rhombus with the vertical diagonal of 3.5 mm long there are two letterings: "BMF" (with the "M" and "F" letters being fused) and "ASII" (which means Alpacca Silber II) and a profile of a walking bear similar to that on mark No.2. 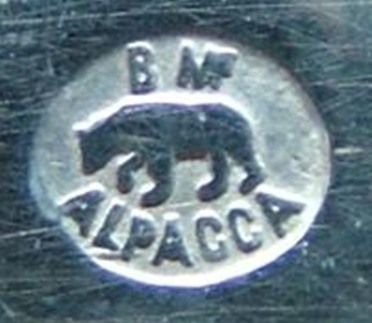 The second (No.7) and the third (No.8) Berndorf Alpacca Silber II marks were introduced in 1930 and used until 1938. They both use the rhomb with the vertical diagonal of 6.1 mm and the bear profile similar to that on mark No.3. The difference between the two marks is the additional circle of 1.9 mm in diameter bearing the lying "E" letter in the case of No.8. 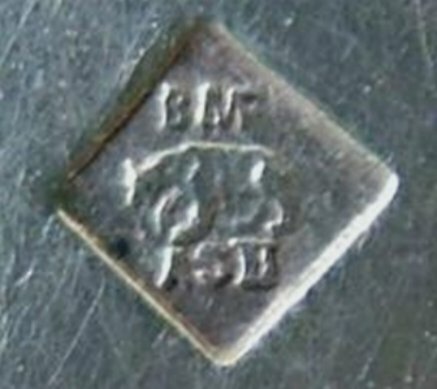 The presence of this additional circle testifies that the item with such a mark was issued by the Esslingen branch of Berndorf factory (Esslingen am Neckar, Baden-Wuerttemberg, Germany). 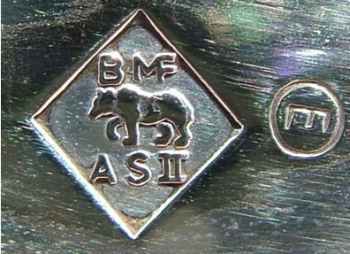 I believe that my list of marks used by the Berndorf factory for low-quality items is far from being completed, i.e., the ASII marks for the 1938-1945 period are absent. But for a passionate collector the absence of something (marks or rare pieces) in a collection is a challenge, which drives his/her life. - Ingrid Haslinger, Tafelkultur Marke Berndorf, Das Niederoesterreichische Erfolgsunternehmen Arthur Krupps (Ketterl Verlag, Wien, 1998), pp.1-174, (in German). - Dedo von Kerssenbrock-Krosigk and Claudia Kanowski, Modern Art of Metallwork (Berlin: Broehan Museum, 2001), 1-598. - Musterbuch ueber Tafelgeraete in Alpacca-Silber I, Alpacca-Silber II und Alpacca, Unversilbert (Berndorfer Haus, Berlin, 1928), pp.1-53, (in German). - Waltraud Neuwirth, Bluehender Jugendstil Oesterreich, Band 2: Firmen und Marken [Art Nouveau in Blossom - Austria, Vol. 2: Companies and Marks]. Vienna: Selbstverlag Dr. Waltraud Neuwirth, 1991, 1-288 (in German). - Wikipedia, Die freie Enzyklopaedie. "Ernst August Geitner". http://de.wikipedia.org/wiki/Ernst_August_Geitner, 2007 (in German). - Wikipedia, Die freie Enzyklopaedie. "Neusilber". http://de.wikipedia.org/wiki/Neusilber, 2008. (in German).